Michael Jackson is a video slot machine that was created by Bally. As the name suggests, the game’s theme is inspired by the late king of pop Michael Jackson. It even comes with video clips and audio clips of Michael Jackson’s songs. The game possesses 5 reels and 3 rows. Gameplay, Betting Real Money. The minimum amount allowed is 0.40, and the maximum is set at 80. Players can deposit real money for the bets using credit cards, prepaid cards or debit payment services. A player then selects paylines to activate, and the amount for the gamble then presses the auto play button. Players with tablets and mobile phones can play a mobile version of the game. Android device users can download it from the Google Play Store. Michael Jackson is an entertaining game to play. It is also a lucrative slot since it has features that can even double winnings. Bonus symbol. It is represented by an image of Michael Jackson with the word ‘BONUS’ written in red. When one lands on the centre row of the 2nd, 3rd or 4th reels, a wheel that has several prizes is activated. Jackpot symbol. Has an icon with an image of Michael Jackson’s eyes with the word ‘JACKPOT’ in red. When it occurs on an active line 5 times the prize is 2500x the line bet amount. Wild symbol. The icon is the sparkly word ‘WILD’ written on a blue background. It substitutes for any symbol apart from the bonus and jackpot symbol. The jackpot symbol offers the highest pay-out at 2500 times of the line bet amount. Players should always try to get the special icons because they come with various prizes. Beat It Free Spins. The gambler gets 10 free rounds. While playing these free games, all wilds that appear remain in their positions for the duration of the free spins. These wilds do not appear on the first reel. Smooth Criminal Free Spins. This option comes with 5 free rounds that can. During the free spin 1 or 2 reels can be completely occupied by wilds. Moonwalking wilds. The icons are represented by the words ‘DOUBLE WILD’ written on a blue background. They occur randomly when, during basic spins, Michael Jackson moonwalks across the screen revealing 2-5 double wild symbols. These double wilds cannot be used to replace jackpot and bonus symbols. They multiply the winnings from any active lines by 2. Stacked wilds. Their icon is ‘WILD’ written on a purple background. They appear randomly during the basic spins and place wild symbols on all the rows of 2 reels. The casino slot conceptualized by Bally software is dedicated to the legendary singer Michael Jackson. The theme, graphics, background music (Michael Jackson’s song playing in the background), all these features will remind a player of him. The game is of medium volatility as it is easy to play and safe to gamble big amounts. But also, the game offers a constant thrill to the players because of its amazing and intriguing features. Michael Jackson casino slot is not available for demo or free version and can be played with real money. Also, the game is ‘penny slot’ which means it allows a player to play after paying little money and earn huge rewards. 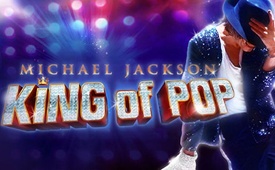 Michael Jackson slot pokie is one of the best slot games when it comes to features. It is a non-progressive video slot with an overall frequency of about 40.97%. The game offers a variety of symbols with different values. The wild when appears on the screen can replace all symbols except bonus and jackpot to form winning combinations. This casino slot offers bonus rounds, a 2x multiplier and 10 free spins (when the desired combination appears on the reel). The slot also offers 3 bonus symbols in the form of Michael Jackson’s portrait which when appears on 3 central reels activate the Platinum bonus game. The most attractive part of the game is its jackpot. When 5 jackpot scatter symbol (Michael Jackson’s eye with ‘JACKPOT’ written in red) appears at once on all reels activates prize worth 2500x the total bet amount. Online Michael Jackson slot machine is easy to play but also offers a good deal of wagering options. A 3D slot, the game offers minimum and maximum bet varying between 0.4 and 80 respectively. The highest payout of the game is 40,000,000 times the total bet. Players should look out for the symbol of Michael Jackson which is the highest paying symbol. The player is supposed to decide the number of coins and start the spin. A player will win rewards depending upon the winning combinations formed. The slot offers many ways to withdraw as well as deposit money in order to play the game. The various options available are a credit card, debit card, EcoCard, UseMyWallet, NETeller etc. The deposition and withdrawal are safe here and it can be trusted. Also, they offer instant withdrawal options for the players. What casinos have Michael Jackson slot machine by Bally? All online casinos are offered below the slot machine – we chose only that offer this particular virtual slot for real money with free spins. On which mobile devices Michael Jackson free online slot is available? Android, iPhone, iPad and many more as we have amp version of the website which is simple and fast – instant play is guaranted.